Many people tend to believe that they need to have someone look after their dog or put them into a kennel when they want to have some fun boating. This is not the case, boating with your pet is very viable. However, to have a fun and keep your dog safe boating trip, you’ll need to ensure that you have the right dog boat accessories. There’s nothing better than a boat trip on a warm summers day. It’s very important that you always plan and prepare yourself for any trip. This also involves planning your doggy boating trips. There is a load of different dog boating gear on the market which you can choose from. Though, the market is also crowded with cheap, low quality products which you’ll want to avoid. I’ve decided to compile a list of the best dog boat accessories which you’ll most definitely need. Yes, I’ve done all the research for you and have personally used many of the items which I’ll be recommending to you. These boat accessories will provide you with ultimate peace of mind. I don’t know how anyone can relax when they know their pets are at risk. Not only will these accessories make your experience more comfortable, but they’ll make your experience more fun and enjoyable with is the main purpose for your boating trip in the first place! This must be one of the most essential accessories when boating with your dog. Many people seem to think that they don’t need a water bowl because they’re surrounded by water. This is complete idiocy. You most definitely do need a water bowl. You cannot simply let your dog drink water from natural bodies of water. The water from oceans, lakes and rivers contains harmful bacteria which could cause your dog to fall sick. If you want to find out more on this topic then I’d suggest you have a look at this detailed article, explaining the side effects of drinking salt water. As you may already know, you cannot use just any water bowl which you already have at home. These type of water bowls will just spill everywhere. Instead, you’ll need to purchase a specialized dog bowl for boats. 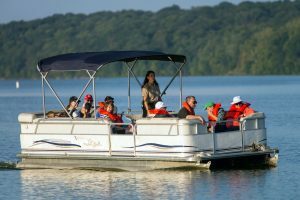 These specialized boats are designed to withstand the violent conditions which your boat may be susceptible to. There are quite a few different dog bowls for boats on the market. Some are better than others, but I’ll help you out by recommending you one of the best. I’m talking about the ‘Buddy Bowl’. I don’t think there’s a better dog bowl that you can purchase for such a low-price tag. This must be one of the best dog bowls for boating on the market. This is perfect for all types of boats, you simply cannot go wrong with it. This product is completely spill and splash proof. This will prevent you from wasting water and it will also keep your deck nice and dry. Comes in two different sizes (32 ounce and 64 ounce) making it perfect for any size of dog. If you have a smaller dog then you may want to get the 32-ounce option, whereas a larger dog would need more water, so the 64 ounces would be more sufficient. This bowl is designed to prevent dogs from drinking to fast. This is great for conserving water and preventing your dogs from suffering from water poisoning. I’d say this product is almost necessary. It’s also very cheap and affordable so there’s no excuse not to provide your dog with such important doggy gear. Just like everyone else on-board, you dog deserves a lifejacket. If you care about the safety of your dog, then this is an essential piece of gear. You may be thinking to yourself is this is necessary because your dog can swim. However, some dogs are better swimmer than others and there are many external factors which could affect your dogs swimming performance. For example, heavy winds and violent waves could make swimming very difficult and ultimately lead to a tragic incident. Therefore, it’s better to be safe than sorry. You may not plan to let your dog go swimming however what is an incident occurs which involves your dog being thrown overboard? It’s also possible that your dog could simply fall overboard or slip whilst running around when excited. You’ll be so happy when you find your dog floating safely on top of the water. None wants to be worrying about the safety of their dog all the time. How can you truly enjoy yourself with worries on your mind? Claim your ultimate peace of mind with the purchase of a dog lifejacket. This must be my favourite doggy life jacket. I’d highly recommend it to all dog owners. This jacket is available in multiple different sizes (X-Small, Small, Medium, Large and X-Large). This makes it perfect for dogs of all shapes and sizes. You should be able to find the right size for your breed of dog. This jacket comes in multiple different colours. This means you should be able to find a lifejacket that both you and your dog like. I like to match my dog’s lifejacket with the colour of my boat. The choice is completely yours! One of my favourite features about this lifejacket is the little front neck float that supports your dogs head and keeps it above water. This is not something which every doggy lifejacket has so I really appreciate this product. This jacket features grab handles which make it easy for you to pickup your dog or rescue them if you must. It’s always great to have a getaway plan. There are so many more great features which you’ll love. Such as the jackets reflective accent which increase visibility, it’s adjustable straps, neoprene belly band and much, much more! There’s really no reason not to purchase this product, it’s simply one of the best on the market. Boat ramps are not an essential dog boat accessory for everyone, however it may be a good idea depending on your dog. Boat ramps are particularly a good idea for those with larger dogs. Hauling a large dog onto your boat can be quite the struggle, however with the use of a boat ramp it will be easier than ever. Even if you don’t have a big dog, boat ramps are always a good idea. They’re not horribly expensive either, they certainly shouldn’t break the bank. I’ll recommend you one of the best boat ramps for dogs on the market. This is the ramp which I’ll be recommending you purchase if you want a high-quality ramp which also comes at a low price. This truly is a bargain, and great back for your buck. Solvit are a well-known brand which produce some amazing products catered for pets. This pet ramp is no exception. This is a very lightweight ramp which is also foldable, which makes it very portable and allows you to bring it whether you go. Indentations under the railing act as a handy handle which make the ramp easy to carry and adds to the products portability. Because of its ability to fold it is also able to fit into small spaces which is great is your boat or car has limited storage space. Though this ramp is designed for SUV’s, trucks, and cars, it works great for boats due to it’s high traction walking surface. It has a textured surface which works like skate boards to prevent slips. This is very useful as it will prevent your pet from slipping even if their feet or the ramp gets a little wet. There really is no reason to not purchase this pet ramp. For what it’s worth, you’re getting a bargain of a deal. Even if you don’t decide to purchase this ramp there are plenty more on the market which offer similar features. Some people believe that having a pet potty on board isn’t necessary as they believe their dog will relieve itself in the water. Though, your dog is more likely to take a dump on your boat then it is in the water. When your dog is ready to go, it’s ready to go and it’s not going to go out of it’s way and hop into the water. Sure, you may dock your boat and walk your dog every now and then however as I stated previously, it’s not always going to wait till it’s off the boat to relieve itself. Also, docking your boat every so often can become a nuisance. Pet potties are so cheap nowadays that there’s really no need to go through so much hassle. 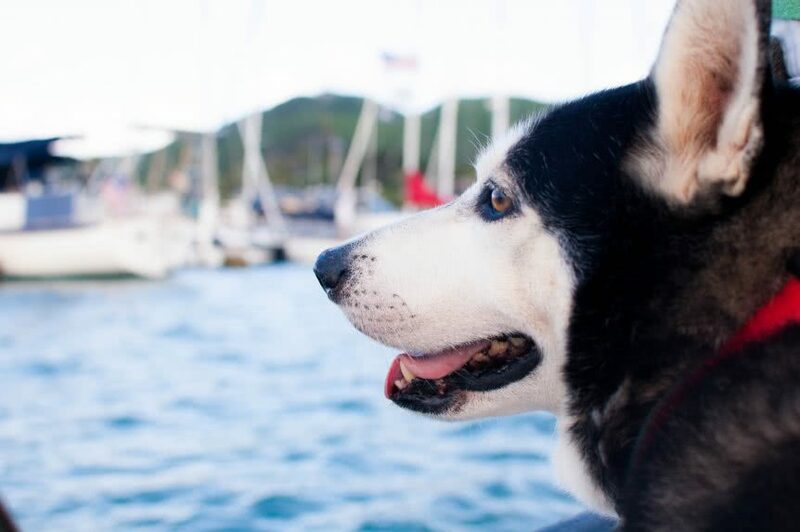 Not only will a pet potty keep your boat sanitary, but it will make your dog more comfortable when boating. Keep in mind that you can’t just bring any old pet potty which you have lying around at home, on board. You’ll need a specialised pet potty which can withstand the unpredictable movements which it will be vulnerable on board a boat. You don’t want your potty to be thrown against the wall, resulting in an awful mess which you’ll have to clean up. The portable toilet which I’d recommend is the Pet Loo by PetSafe. As you may have noticed, I’m a big fan of this brand. They provide some of the highest quality products on the market specialised for dogs. This is an amazing portable dog potty which comes in three different sizes, making it a perfect choice regardless of the size of your dog. There are a wide range of different benefits and features which this potty has to offer. This product features an innovative drainage system with synthetic grass which will drain away urine from the surface effectively. This makes it so much more sanitary and prevents your dog from tracking urine around your boat with it’s wet paws. This is a real highlight for this potty. This product has a very clever feature which provides immediate odour control. Wee sponge powder is utilised to absorb urine and turn it into a gel on contact. This prevents the urine from releasing a foul odour. None wants to smell their dogs waste whilst trying to relax, so this is an amazing feature to have. A reinforced base is useful for supporting your dogs weight. This makes the potty great for those with big dogs. It’s not a rare thing for pet potties to collapse from the weight of large dogs such as huskies and boxers. This is not a problem with this potty, especially if you purchase the large size. One of my favourite things about this potty is how easy it is to clean-up. The clean-up process for some potties can be very tedious and unsanitary however it’s never been easier with this product. Removeable collections bins are very easy to pull out and dispose of. Pee-pods with wee sponge also make the process very clean and easy. Your dog isn’t invulnerable to the sun. It’s not only you he needs sunscreen on a boat, your dog will also need some too! Prolonged exposure to the sun isn’t good for dogs, and they’ll need some protection against it otherwise they could suffer from sunburns. Dogs are especially vulnerable to sunburn on their ears, bellies, and noses. Also, if your dog is hairless or even have short hair then they’re at a higher risk of sunburn. It’s important that you don’t just use any old sunscreen on your pet. The sunscreen which lifeguards use on their noses will contain zinc oxide. This is very effective for humans however toxic for dogs. It’s important that you are aware of the risks of using human sunscreen on a dog. Instead, you should purchase a specialised sunscreen for dogs. I’ve done the research for you, and I’ll be recommending you a great sunscreen perfect for your dog! There’s not much to say about it, it’s a sunscreen for dogs. This product can be used all year-round to protect your dog from the harsh UV rays of the sun. This product features natural Aloe Vera which provides extra moisture and keeps your dogs skin nice and moisturized, preventing it from drying out and becoming scaly. The sunscreen is completely safe and non-toxic. Only FDA approved ingredients are used which will defend your dogs skin from the sun. Applying sunscreen has never been easier with this hand spray bottle that makes coating your pet in a light coat of sunscreen a breeze! The sunscreen will dry and in seconds and become lick-safe when dry. Previously I had recommended that you purchase a boat ramp which is great for getting your dog onto your boat from land. However, you’ll also need something to help get your dog into your boat from the water. Dogs love to swim around, this is the best part of boating for them! This makes it important that you have a way of getting your dog back on board after their swimming session. If you’ve already tried, then you’d know that trying to get them back on board by hand is very difficult especially if you’ve got a large dog. If you haven’t tried and you think it will be easy, just remember that your dog is likely to be excited and wiggling around whilst extremely wet. So, it’s not as easy as you may think. When trying to pull my dog back on board I’ve been badly scratched on multiple occasions. This is probably one of the best doggy boat ladders on the market. It is the perfect choice a boat ramp for many reasons which I’ll briefly explain. For one, it features a slip resistant ribbed design which makes it very safe for your pets even in very wet conditions. The biggest concern when choosing a boat ladder is the risk of your dog slipping. You wouldn’t want your dog slipping while climbing into your boat. This makes this boat ladder a great choice. This ladder is very easy to carry and folds in half for easy storage. This not only makes it very portable but means it doesn’t take up much space in storage. Most if not all the items on this list help keep you and your dog comfortable. Being comfortable is one of the most important things besides your safety. Therefore, a dog bed is an essential product when it comes to boating with your dog. Features a waterproof removeable and washable inner which protects the dog beg from doggy accident and water which it may track on board. High quality memory foam, which provides your dog with a luxury sleeping experience. Your dog may sleep better than you! Medical grade orthopedic support, making it great for older dogs which may have muscle pains, hip dyspepsia, aching joints, and arthritis.